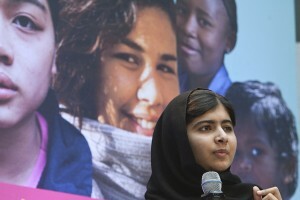 Malala Yousafzai was shot in the head by the Taliban when she was 14 years old. By now you’ve probably heard of Malala Yousafzai, the young Pakistani education activist who survived an assassination attempt at the hands of the Taliban last year. Ms. Yousafzai is a symbol of hope and strength for children all over the world who are denied an education, and her peaceful approach to making change has been recognized by global humanitarian organizations. She is courageous, inspiring, and on a mission to empower young women by providing them with an education. Read our full profile on Malala Yousafzai here.